Description: Selecting the right curriculum can be a time consuming, heart wrenching task for any family that chooses home education. 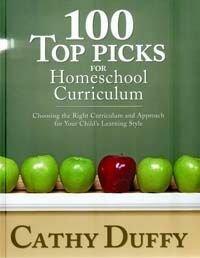 Now, homeschooling guru Cathy Duffy makes choosing the right resources for your child easy! Cathy guides you through the process, offering her "Top Picks" from each subject area, narrowing down to a manageable number of choices. Parents no longer need to sort through the entire universe of products before they can find something suitable. In 100 Top Picks, Cathy narrows the focus and simplifies the curriculum selection process with questionnaires and charts. She walks her readers through the process of figuring out their preferences in terms of a philosophy of education, learning styles, and goal setting. A major feature of 100 Top Picks are the charts showing the 100 Top Picks in relation to educational approaches, learning styles, and practical features such as prep time needed; design for independent, one-on-one, or group learning; and ease of use for the teacher. Complete reviews of each of the Top Picks provide parents the information they need to make the best choices for each of their children. 100 Top Picks gives parents just the right balance of guidance and choices so they make well-informed choices in their curriculum purchases.